This year saw the most ambitious crossover to date on The CW's Arrowverse, with "Crisis on Earth-X" bringing all of the small screen superheroes together to fight evil Nazi doppelgängers. 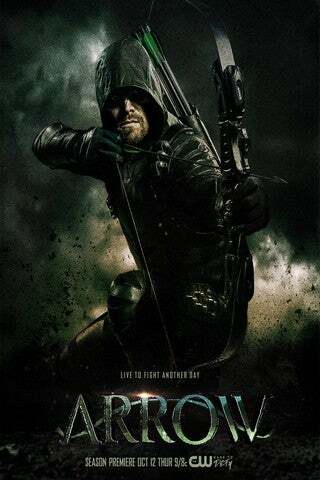 Though Arrow and the other series have yet to be greenlit for more seasons, the network president seemed hopeful that we'd definitely be getting more episodes, leaving the task to Arrow executive producer Marc Guggenheim to start brainstorming ideas for next year's crossover. We spoke with Guggenheim at ACE Comic Con in Phoenix to find out his plans to top the epic of "Crisis on Earth-X", where he teased their plans for the future. "We always sort of talk about it… I always say, the crossover is a really difficult labor," said Guggenheim. "It's like going into the room of a woman who just gave birth and she's still swaddling her newborn and you ask 'so how about the next one?' At the same time, we've had discussions. "We know that the crossovers are a fact of life. I do think that there's a big desire on the part of all of us, as well as the studio and the network, to do the crossover differently than we did this past year. In part because I honestly don't know how we top it. And also because the level of ambition was so high that it affects a lot of different things. It affects schedules, it affects casts, it affects budgets." Guggenheim hinted that they might not go the typically comic book-inspired route of bringing every character together for an epic battle, much like they did in "Crisis" and in "Invasion!" That said, the plans are still up in the air. "We haven't talked any specifics but we have talked about a general agreement of thinking outside the box and doing something a little differently than what we've done in the past," Guggenheim said. "What that is, I have no idea. None of us really know." There's also the possibility of newest series Black Lightning being involved in the crossover, though Guggenheim was careful not to confirm the character's involvement. "My preference actually would be to start talking about it sooner rather than later. Because it really is like doing — I know there's now five shows along with Black Lightning, that's not to say that Black Lightning is a part of the Arrowverse, that's above my pay grade — but I will say whether you consider it four shows or five shows, doing the crossover is like doing a fifth or sixth show. And getting out as far ahead of it as possible is always good." Arrow returns to The CW on January 18th with "Divided."